I remove each item, assessing its value. Does it get tossed into the trash or can someone else use it? How do you begin to sort through a house filled with stuff? Closet by closet, cabinets and drawers. Some of it just half empty bottles of soap or mouthwash and then there are all of these coffee cups. Where did they all come from? I am the judge sitting here deciding the fate of so many memories and mementos. Which items will make the cut to come with us as we start the next chapter of our lives? Some decisions are simple. The salad spinner, still in the box…give away. 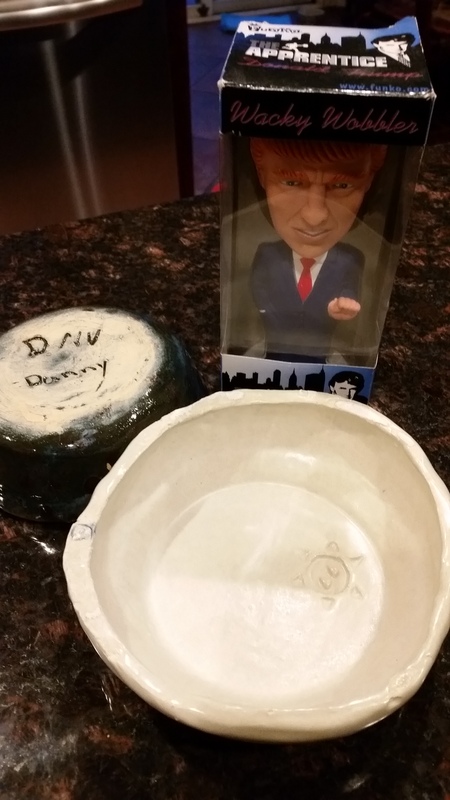 The two lumpy bowls made in ceramics class by the kids…coming with us. Books that I will never read, but had every intention of doing so…give away. The bobble-head Donald Trump doll that will make the absolute best white elephant gift, should I ever go to one of those parties …has to make the trip. 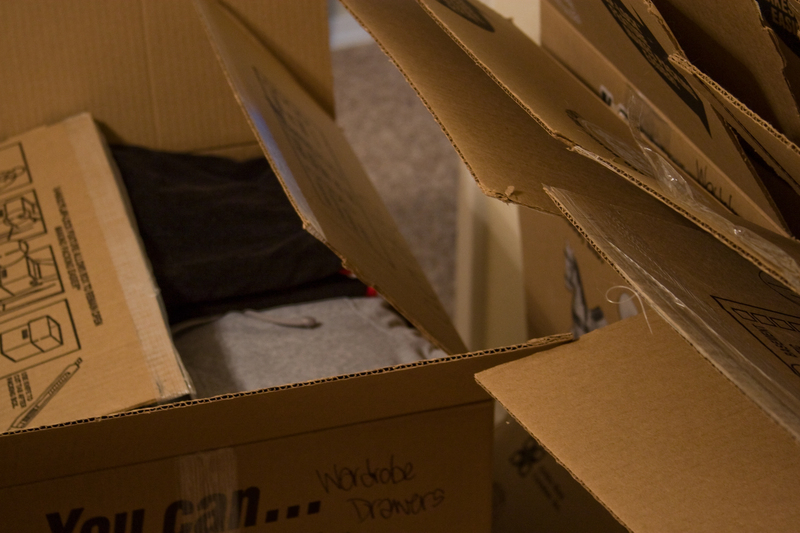 Just the process of packing and purging brings up so many emotions. 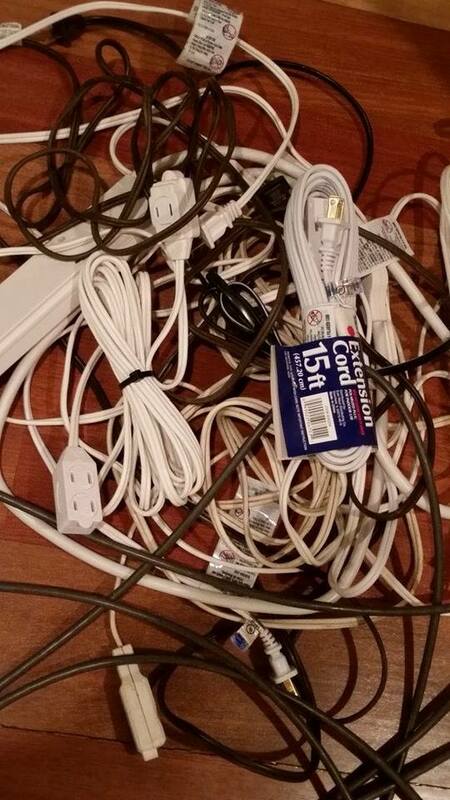 Feelings of disgust as I discover twenty extension cords in the back of a closet. So many times I searched for one of these and ended up going and buying another one. Feelings of guilt and sadness as I find notes from my children telling me they are sorry for fighting or that they are grounding themselves for the rest of their lives for kicking a hole in the door. Could I have been more forgiving? I was a crazy stressed out parent at times. I will have to remind them of these. I take a photo of the notes and keep going. Sadness for knowing we will be further away from our beautiful kids and grandkids. Will we all still get together and wear our pilgrim and Indian hats on Thanksgiving? Will they forget what we look like? Thank goodness for Skype, Facebook and airplanes. We are moving from a large house with 4 bedrooms, 2 offices, 5 bathrooms and way too many closets to stuff things inside, to a two bedroom apartment downtown Chicago. How can we fit our life into such a small place? We must make decisions, so many decisions. We have to sell one of the cars. People don’t drive everywhere in Chicago like they do in Roxborough Park. Do we give away the living room furniture or put it in storage. Perhaps we should just rent a giant storage unit that can hold every memory. That would make me sad, to think of the chairs and tables that have seen parties and family game nights, sitting in a dark cold storage unit. We need to get these pieces into someone else’s home where kids can do homework around them and families can watch movies on them. 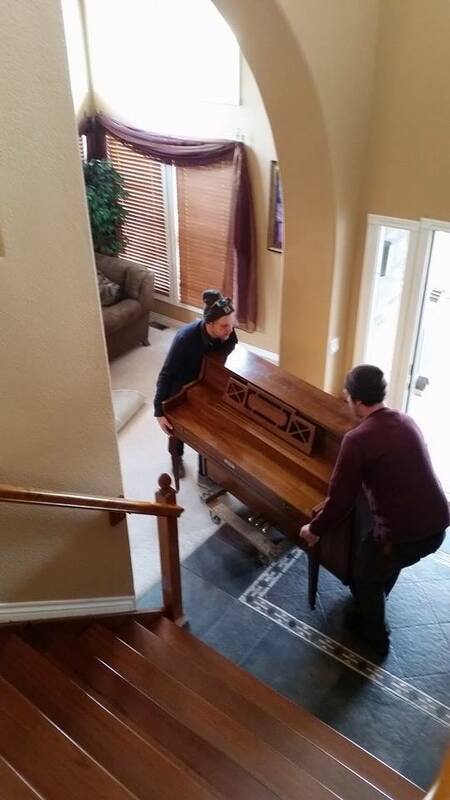 Someone will finally play that old piano. It will be happier. I keep going from excitement, knowing it is a new chapter in our lives and a time of new plans and new adventures, to tears, saying goodbye to so many plans and projects completed. It’s good for couples to keep planning; to keep looking toward the future with excitement and yet, I keep looking around and thinking of all the things I will miss. We planted so many trees, bushes and flowers here. 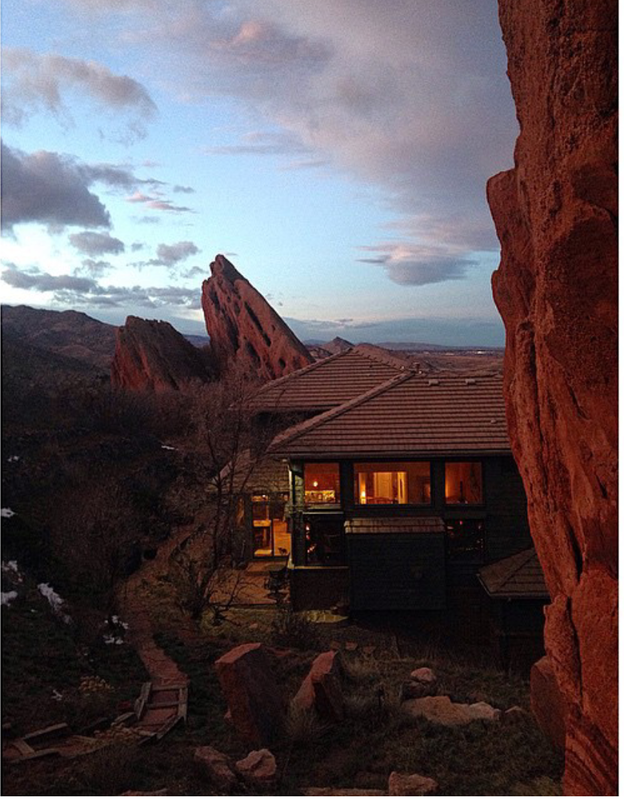 We had patios and vistas put in to sit and look out over the Denver skyline from high atop our private cove of beautiful red rocks. Is it the stuff? The things? The garden, the big fire pit the beautiful gold star painted on the ceiling of the dining room that I loved to look at each time I walked by? 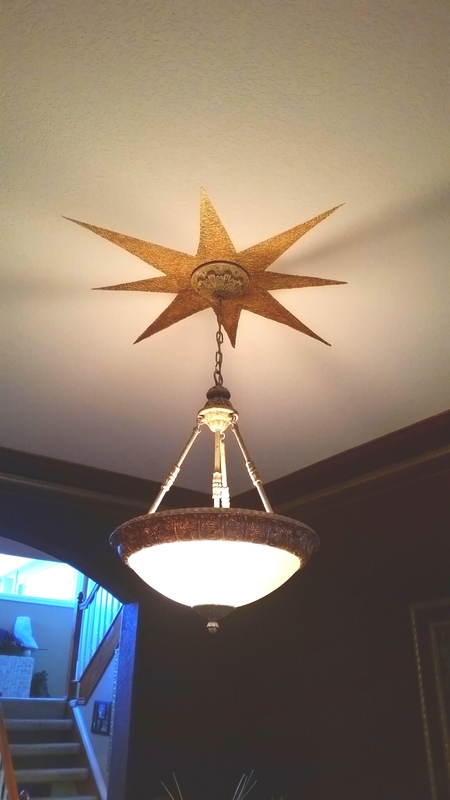 I always admired the boldness of having a giant gold star on the ceiling and yet there was one side that was slightly crooked, and I always said I would fix it. I loved late spring in Colorado. I’ll miss standing outside every morning in the garden watering the flowers, letting my mind just wander as the plants soaked. I was usually whistling a little too loud right below Bailey’s window. As soon as I would go inside a family of deer would usually mosey by and snap the tops off the freshly watered plants. I would run out and chase them off swearing I’d find the right kind of spray to keep them off my plants. I shall miss that battle. All those nights we would all sit bundled in blankets around the fire pit roasting marshmallows and Starburst candy until we felt sick. Is it just the memories? We can take the memories, without even packing them into boxes. We can plant another garden on the rooftop, where I will not have to battle the deer and maybe we can bundle up and sit outside at night around a fire pit. I’m definitely going to paint a gold star on the ceiling in our new home. What a beautiful writing of such an emotional time. I am sure you’ll hold tight to the special memories even as you begin to make new ones…and you are such a bright star, I have no doubt you’ll find the perfect place for the new gold one to be painted in Chicago. Thanks Deb! It is definitely bitter-sweet. Right now I’m craving more SWEET! Thank you Annie! As a kid I moved a lot and always enjoyed meeting new people and having new places to explore. I will surely get that feeling again once I make it through the mess of packing. Thanks again for your sweet well wishes.